This is the second post in a three part series on reducing the stress of personal finance. Each of the posts will detail a simple technique to reduce financial headaches. The first post discussed using a personal escrow account to help smooth out yearly or irregular payments. This post focuses on smoothing out monthly spending. While using a credit card to gain frequent flier miles or travel points is very popular for discretionary spending, it’s too easy to spend more than your budgeted amount. Yes, you can track your credit card spending online, but that is a reactive process because you see the charges after they are posted to the card. 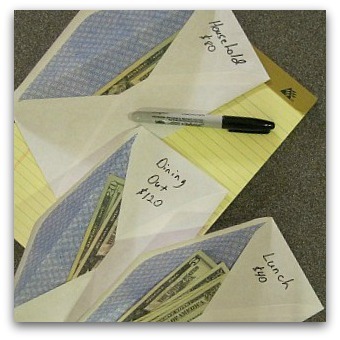 A proactive approach to discretionary budgeting is the “envelope method”. The process is as simple as putting cash into envelopes and then spending cash rather than making credit card charges. And when the money in an envelope is gone, you are S.O.L and your spending in that category is finished for the month. This method has been made popular by Dave Ramsey. My wife and I have been using this technique for several years now. It has led to fewer months where our credit card spending was over budget. More importantly, it has reduced the stress and frustration over our spending since we are able to see our spending limits in the form of cold hard cash. Using the envelope method doesn’t require you to stop using your credit card. We still use our credit card for groceries, gas, clothing purchases, etc to get our travel points. To setup your envelope system, first determine which of your budget categories you will switch over to cash. You can start with one or two categories to test the system. For each category, label an envelope and write the dollar amount allocated for that category. On the first of each month, take out cash to fill the envelopes. Once filled, your spending limit for the month is set. Obviously, your categories will be different based on your spending habits. Got a habit of buying too many cycling caps? That’s ok. Setup a limit for those purchases and don’t feel bad about it. Trying to cut back on how many lunches you eat out at work? Set a lower limit for that category to help you reach your goal. As with any change to your spending, it may take a couple of months to make it work efficiently. At first, you have to remember to bring cash with you for purchases. This is actually a good problem because it forces you to think about spending money before you do it. With a credit card, it’s too easy to spend $12 here, $27 there, and end up with a much larger bill at the end of the month. Once you get in the habit of bringing cash for your purchases, work on figuring out the correct amounts for each category. Over a couple of months, if you find yourself running out of entertainment money and having excess lunch money, adjust the amounts. If there is one month where you are working on a home project that uses up your household category too quickly, borrow some from the dining out envelope. In this situation, you’re still limiting your spending for the month since you are not using a credit card for the extra household spending. For an even more detailed break down of the envelope method, see WiseBread’s comprehensive guide. Switching to a cash based system can really help you control your monthly spending. There is something about watching the cash leave the envelopes that makes you want to spend less. The less you spend on a monthly basis means more savings for those cycling adventures or family vacations. Thanks Amelia. Sometimes paper and cash work much better than credit cards and online access. Really great advice, thank you! I recently quit my job so until I find another way to get income, money is gonna be pretty tight. Vanessa, glad you found this helpful. Without any current income, the envelopes can be extra helpful in making sure you don’t overspend.